Murphy has a fascinating history. 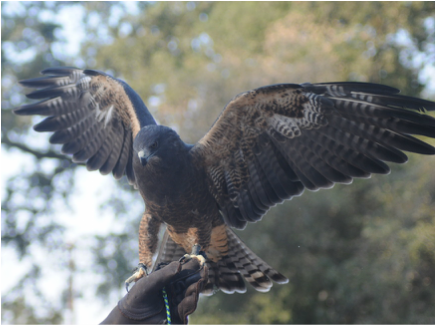 She came into a wildlife rehabilitation group in El Dorado County, CA, unable to fly or stand. Kelli and Carol actually went on her rescue and were in charge of her rehabilitation. She had no broken bones or any identifiable injury. We didn’t know what was wrong with her. She was just – down. After weeks of food and rest, when she seemed to be recovering her strength, she suddenly had a seizure. She came through that with some setbacks, but was alive and alert, and she recovered once more. Then she suffered another seizure, so Kelli and Dr. Carol, HH&H’s vet of record, took her to Dr. Vickie Joseph a well known raptor veterinarian for an assessment. There, a blood test revealed that Murphy was suffering from West Nile Virus. 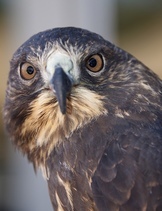 Red-tailed hawks and owls, along with crows and magpies, are very susceptible to this serious disease. Most birds that contract it die – it affects their entire physical and psychological systems. But Murphy was determined to survive. She was under a year old when she came in and now, years later after care and physical therapy, she has recovered remarkably. She still has balance problems, though she is improving in that area. And she will remain partially blind in both eyes. Kelli, her handler and trainer, flies her, gets her to exercise in other ways, and has helped her come to enjoy entertaining a crowd. But she sees well enough to fly on a creance (a long flexible leash). Kelli has Murphy leashed to her glove so that she can control, to a degree, where and how far Murphy flies. It is good exercise for all concerned! If you click on the video link, you will learn more about Murphy and see her flying for food treats. Bolt came from the Lindsay Wildlife Museum. He had been rescued as a yearling by some town folks who found him on the ground in their garden, unable to fly. On examination, he was found to have an injured wing, probably from hitting something as he was hunting. 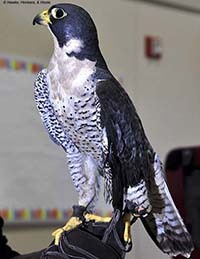 Peregrine falcons eat birds they catch in flight, and they dive very fast in a hunt. Young ones sometimes tend to lose control and crash on landing. Despite treatment, Bolt’s wing didn’t recover, but he showed a willingness to work with us clumsy humans. After a couple of setbacks, he is now ready to show once more how beautiful and aerodynamic the falcon’s form really is. 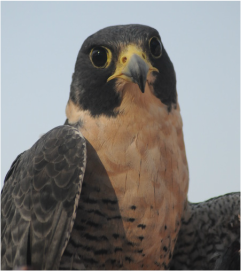 When you see his sleek lines and pointed wings, you’ll understand why the Peregrine, who can reach speeds of about 250 mph in a dive, is called the Fighter Pilot of the Bird World. Just a little sweet gal, Digger came to us from Folsom, where she most likely had been hit by a vehicle. After a visit to the wildlife ophthalmologist, it was concluded that that the damage to Digger’s left eye was so severe that she would no longer be able to see. If you look closely at her, you can see that her pupil is misshapen – it is oval rather than perfectly round like her right eye’s pupil. Being a Burrowing Owl, Digger is quite different from the other owls in town. While other owls are sleeping during the daytime, Digger is awake and looking for something to eat. She enjoys small mice, lizards, and insects, but her favorite treat is a jumbo mealworm! Also, Burrowing Owls don’t live in trees like their cousins do – they look for an underground tunnel that was already made (and abandoned) by a small mammal, such as a ground squirrel. Burrowing Owls will move right into a pre-made tunnel out in grassy prairies and farmlands. They have a brilliant habit of lining the inside of their new homes with cow (and other animals’) dung. The dung offers many advantages; is stabilizes the walls, it also insulates the borrow. When a predator is near a dung-lined tunnel, chances are increased that he will pass on by, smelling dung and not a Burrowing Owl, eggs, or owlets. Plus, this has the added advantage of attracting dung beetles (a tasty snack!) right to their front door, clever! When Trek was rescued Dr. Joseph originally thought perhaps Trek had West Nile Virus that compromised his vision. He also had an infection in his fourth toe on the right side that had to be amputated, which now doesn’t seem to bother his grip or stance. Because of these disabilities, Trek was deemed non-releasable back to the wild. He then came to us to become a permanent education ambassador in April of 2014. 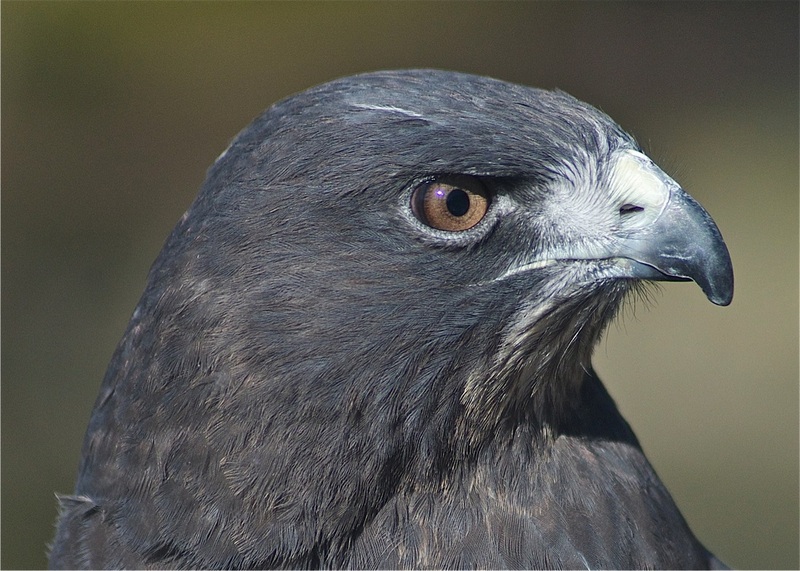 He has matured into a beautiful dark morph which we are told that in Swainson's Hawk represents only 2% of their species. Trek is excellent on the glove and is an outstanding steward for raptors at our many public events. 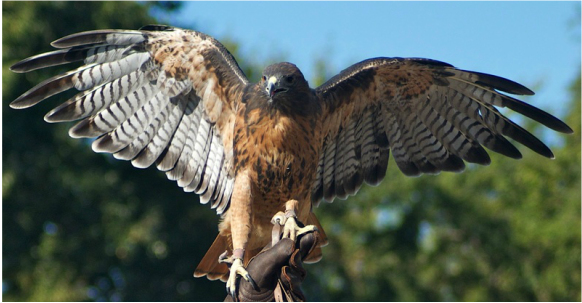 He is named Trek because of the annual migration that Swainson’s Hawks make to Mexico and as far as Argentina every winter. Northern Pygmy's are the second smallest owl in the United States. Whoo-Dini has an injured right wing which is why he came to HH&H in December of 2016. 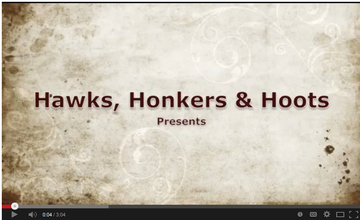 He is learning to be a fantastic Ambassador for Hawks, Honkers & Hoots. Northern Pygmy Owls are diurnal, meaning that they are day owls - active during the day light hours. He weighs in at a slight 70 grams and is no larger than an iPhone 5! These owls may be small but they're mighty in their hunting skills; they can take prey twice their size. Whoo-Dini has earned his name by being one of the best little escape artist ever known! Don't miss seeing this adorable, handsome guy. 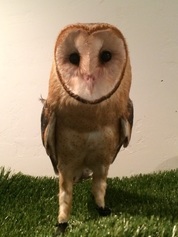 Whisper was found as a very young owl that had fallen out of a very tall palm tree in April of 2017. She suffered some head trauma and was deemed non-releasable so we were able to adopt her. She has been such a wonderful treat for all our volunteers to be around and learn from each other as we get her used to representing Barn Owls. Barn Owls populate every continent in the world except for Antarctica. 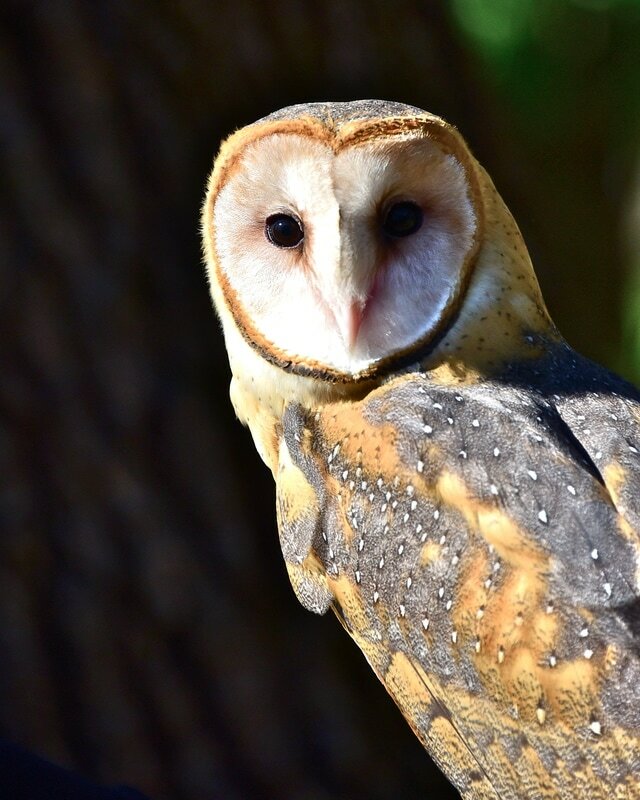 The Barn Owls in the North America are larger than any of the others. They have acute hearing that gives them the ability to successful capture live prey in a completely dark room. Another fantastic fact about Barn Owls is that they are known to consume 1,000 mice every year! Now how's that for a natural pest killer, no need for Decon if you have Barn Owls around. Whisper is a SUPERSTAR in the making, if you haven't had a chance to meet her do come out to one of our presentations, you will be delighted. Hootie was brought in to a veterinarian's office mid summer of 2017 after being hit by a car in the early morning hours. Luckily he didn't suffer any broken bones but he did have a traumatic head injury which affects his vision. He was deemed non-releaseable to the wild and we were fortunate enough to be able to adopt him. He is a very sweet guy that has BIG talons and can be intimidating but that's only if you don't know him. Hootie sits well on the glove and is taking good to his training; we think he loves all the free mice he can eat! We are so happy that he's turned into a fantastic Bird Ambassador for us, he's so handsome! Bobbie came to Hawks, Honkers & Hoots when she was just a little over a month old. 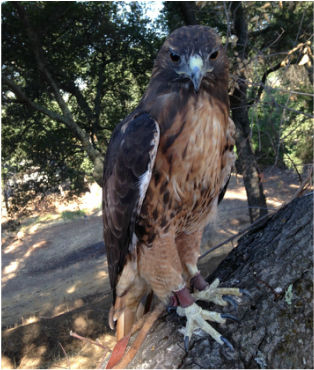 We are unsure of exactly what happened to her but we do know she was brought to California Foundation of Birds of Prey. It was obvious to them that someone unknowingly imprinted her. We can understand why, she's so darn cute, you just want to love on her. We named her Bobbie because she often "bobs" her head. She has taken well to her glove training and already has been to a couple presentations. She has a great personality, she's a BIG ham, can't wait for you to meet her. Frankie & Chuckie came to HH&H in the summer of 2013. They are a bonded pair and came to us as a package deal. This breed is named after Cayuga Lake (one of the Finger Lakes) in New York. Males are usually medium-size, around 8 pounds, with a very handsome iridescent black plumage. Cayuga ducks are also bred for eggs and meat with a large breast and small wings. Again, we have no plans to eat Frankie or Chuckie either!